Mr. Grant Jimerson, age 76, died Wednesday, August 15, 2012 at the Lutheran Home, Jamestown, New York. Born on November 3, 1935 on Six Nations Reserve in Ohsweken, Ontario, he was the son of the late Harry Jamieson and Viola Snow. He attended tribal boarding schools, Thomas Indian School in New York and Chilocco Indian Agricultural School in Oklahoma prior to joining the military. Mr. Jimerson was a veteran of the U.S. Army serving as a Paratrooper, and of the Canadian Armed Forces. He was employed at the Jamestown Hotel, Erie Malleable Iron, Blackstone, and Dawson Metal in Jamestown, New York prior to his retirement. 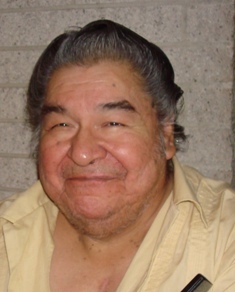 Mr. Jimerson was an enrolled member of the Seneca Nation of Indians and the Bear Clan. His Longhouse name translated to "He Tries". Surviving are: a son, Robert Thomas, Ontario, Canada; a sister, Stella Jimerson, Batavia, New York; 2 sister-in-lawa, Camille Jimerson, Erie, PA, Judy Nunez, Phoenix, Arizona; a niece, Dolores Jimerson, Pendleton, Oregon; 2 nephews, Alan Jimerson, Cambridge Springs, PA, Matthew Nunez, Phoenix, Arizona; several cousins. He was predeceased by a sister, Phyllis Sandy, 2 brothers, Alfred Jimerson and Daniel Nunez. Friends may call at the Faith Keepers School all day Friday. Services will begin at the Faith Keepers School on Saturday at 10 a.m., followed by services at the Coldspring Longhouse at 11 a.m.